by Linda Camp Keith. Philadelphia: University of Pennsylvania Press, 2012. 336pp. Cloth £49.00/$75.00. ISBN: 9780812243819. eBook format. £49.00/$75.00. ISBN: 9780812207033. Reviewed by Mark Fathi Massoud, Politics Department and Legal Studies Program, University of California, Santa Cruz. Email: mmassoud [at] ucsc.edu. Does the rule of law reduce state repression of human rights? More specifically, does judicial independence matter? Scholars, lawyers, and activists have developed a generalized, though still largely theoretical and case-specific, sense that the rule of law and judicial independence do influence the fight against political repression. But we have known very little about the precise impact of law and judicial independence on political repression globally. Enter Linda Camp Keith. Over the last 15 years she and her co-authors have developed a substantial body of scholarship in comparative public law that quantifies the ways that law matters for the domestic protection of human rights (see, e.g., Keith 1999; Poe, Tate, and Keith 1999; Keith 2002; Keith, Tate, and Poe 2009). Put another way, Keith has devoted much of her scholarly life to understanding, both theoretically and empirically using quantitative methods, why states repress their citizens, and the role of law (including human rights law) in combatting this repression. This impressive body of scholarship culminates in Keith’s new book, POLITICAL REPRESSION: COURTS AND THE LAW. To explain political repression, the book sets out to answer three interrelated queries. First, why do state leaders agree to promote democracy and protect human rights, particularly when drafting constitutions? Second, do these constitutional commitments affect whether state leaders repress their citizens? And, third, to what extent does judicial independence affect repression? Here, Keith situates her book as the “first systematic large-N cross-national examination of why states make…formal commitments” to respect rights, freedoms, and judicial independence (p.5). The book’s seven chapters can be divided into four main parts. First is a pithy introduction (Chapter 1) outlining the book’s main concern, argument, and contribution. The author’s dependent variable is state repression of human rights. Framed as a broad research question, the author’s concern is this: Why do states abuse human rights by repressing their citizens’ personal liberties and personal integrity (what Keith calls “political repression”)? The second part of the book (Chapters 2 and 3) encapsulates the theoretical and empirical literature on political repression, including studies of domestic judiciaries and international law. Chapter 2 discusses dominant theories in political science explaining political repression, including rational actor theories, democratic peace theories, [*2] international norm socialization theories, transnational advocacy theories, and world society approaches. To these theories from comparative politics and international relations, the author adds an often-neglected public law perspective, which seeks to reveal how independent judiciaries and the power of judicial review may reduce state leaders’ willingness or ability to repress (see also Ginsburg 2003; Moustafa 2007). Chapter 3 continues to review extant literature and zeroes in on the author’s empirical defense of a rational-choice model of state repression, namely that state leaders repress their citizens in response to real or perceived threats to power. The chapter justifies this “standard model” (p.57) and expands it globally and across time (1980–2005). Keith’s concerns over the “content and construction” of Freedom House and Polity scores (p.102) leads her to adopt new and more specific measures of democracy and categories of repression (p.111). The third part of the book (Chapters 4–6) showcases the author’s quantitative methods, data, and findings in three separate and related cases. Chapter 4 examines the role of judiciaries in state repression of human rights, and asks why states adopt judicial independence provisions, and whether these affect state repression levels. Her analysis reveals that independent judiciaries – themselves part of a global “script” of legal modernity – are associated with lower levels of political repression. Challenging some rational-choice scholarship in international law, she finds that the promise of judicial independence is more than just “cheap talk” (Goldsmith and Posner 2005). Chapter 5 asks why states adopt rights protections provisions in their constitutions, and whether these affect state repression levels. It investigates five individual freedoms (assembly, association, press, religion, and speech) and four due process rights (arbitrary arrest, fair trial, habeas corpus, and torture) across the globe. The chapter concludes by arguing that while its data reveal a regional diffusion of rights packages, the data do not uncover a “global norms cascade” as world society approaches would expect (p.227). Here, data also largely support the hypothesis that due process rights are largely dependent on whether an independent judiciary is present (pp.217, 228). Chapter 6 turns to why state leaders adopt states-of-emergency provisions in their national constitutions, and whether these affect state repression levels. The author considers specifically the impacts of guidelines produced by the International Law Association (ILA) and the International Commission of Jurists (ICJ). As with Chapter 5, the data are “mixed”: here, while they reveal some evidence of a global norms cascade, there is no evidence that “regional norms or the promulgation of the ILA/ICJ standards influences the level of commitment” (p.280). The fourth and final part of the book is a short conclusion (Chapter 7) recapitulating the book’s major findings and pointing the way forward, including calling for further work on the role of international non-governmental organizations (p.295). Overall, this book will benefit the law and courts community for three reasons. [*3] First, Chapter 2 successfully integrates vast literatures across three subfields of political science (international relations, comparative politics, and public law), making it useful reading for undergraduates, graduate students, and faculty seeking to explain the circumstances under which states protect – or fail to protect – human rights. Second, as the author acknowledges, the book’s “primary contribution…lies in the substantive examination of the role of judicial independence and constitutional rights protections in reducing state repression” (p.286). And third, the book showcases the myriad factors that can impact the fight against political repression: judicial independence, international law, the presence of international NGOs, party competition, perceived threats to executive power, legislative strength, globalization, and economic liberalization (p.281). This complex amalgam of factors reveals, quantitatively, that resolving human rights abuses is not as clear-cut as many scholars, lawyers, and activists would hope. While the book has many appreciable benefits, not all in the law-and-courts community may see them. First, those scholars looking for applicable answers and policy proposals may find the data analysis too protracted; policy implications for human rights cast a narrow 2-page shadow (pp.294-295) over the nearly 300 pages of quantitative data analysis and literature review that precede them. Second, some readers may find the results confirming Keith’s and others’ earlier findings to be unsurprising or less stimulating than that prior work, and a few of the book’s sections to be lengthy or repetitive (though the book’s primary research question, some version of “Why Do States Repress Citizens?” appears as a section heading on pages 7, 15, 78, and 285). Finally, short vignettes at the start of each chapter come from the U.S. State Department and Western NGOs, and they document human rights abuses taking place in the global South. Taken as a group these vignettes, along with some of the assumptions animating rational choice models, may distract (or repel) scholars who write at the intersection of public international law and political theory; or scholars who are sympathetic to contextualized, bottom-up, critical, historical, or anthropological approaches to human rights (e.g., Merry 2006; Mutua 2008) and to Third-World approaches to international law (Anghie 2007, Rajagopal 2003). The central contribution of Linda Camp Keith’s book lies in its important empirical findings. Extending the quantitative political repression data across a long time series from 1980 to 2005 and conducting a large-N global study of this nature are no small feats of scholarly effort and the results of decades of work. In addition, bringing public law’s insights to bear on a debate otherwise occupied by comparative politics and international relations scholars is a huge step forward for the discipline of political science. 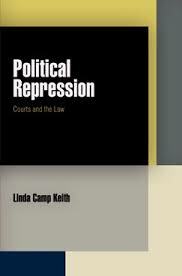 Future graduate students interested in quantitative approaches to studying human rights and the rule of law have a multi-subfield and multifaceted model in Linda Camp Keith’s POLITICAL REPRESSION: COURTS AND THE LAW. Anghie, Antony. 2007. IMPERIALISM, SOVEREIGNTY, AND THE MAKING OF INTERNATIONAL LAW. Cambridge: Cambridge University Press. Goldsmith, Jack L., and Eric A. Posner. 2005. THE LIMITS OF INTERNATIONAL LAW. Oxford: Oxford University Press. Keith, Linda Camp. 1999. “The United Nations International Covenant on Civil and Political Rights: Does It Make a Difference in Human Rights Behavior?” JOURNAL OF PEACE RESEARCH 36: 95–118. Keith, Linda Camp. 2002. “Constitutional Provisions for Individual Human Rights (1976–1996): Are They More than Mere ‘Window Dressing?” POLITICAL RESEARCH QUARTERLY 55: 111–43. Keith, Linda Camp, C. Neal Tate, and Steven C. Poe. 2009. “Is the Law a Mere Parchment Barrier to Human Rights Abuse?” JOURNAL OF POLITICS 71: 644–60. Merry, Sally Engle. HUMAN RIGHTS AND GENDER VIOLENCE: TRANSLATING INTERNATIONAL LAW INTO LOCAL JUSTICE. Chicago: University of Chicago Press. Moustafa, Tamir. 2007. THE STRUGGLE FOR CONSTITUTIONAL POWER: LAW, POLITICS, AND ECONOMIC DEVELOPMENT IN EGYPT. Cambridge: Cambridge University Press. Mutua, Makau. 2008. HUMAN RIGHTS: A POLITICAL AND CULTURAL CRITIQUE. Philadelphia: University of Pennsylvania Press. Poe, Steven C., C. Neal Tate, and Linda Camp Keith. 1999. “Repression of Human Rights to Personal Integrity Revisited: A Global Cross-National Study Covering the Years 1976–1993.” INTERNATIONAL STUDIES QUARTERLY 43: 291–313. Rajagopal, Balakrishnan. 2003. INTERNATIONAL LAW FROM BELOW: DEVELOPMENT, SOCIAL MOVEMENTS, AND THIRD WORLD RESISTANCE. Cambridge: Cambridge University Press. © Copyright 2014 by the author, Mark Fathi Massoud.